A popular option for pool fencing is aluminum, due to its durability, low cost, and range of available styles. As you are creating the perfect outdoor space for your home, safety and style are some of the most critical concerns. Luckily, there are many fencing options for swimming pools. A range of design and material options are available to choose from. When choosing the right fence for your outdoor space, there are a few important things to consider along the way. Consider durability, style, and cost when making your decision. 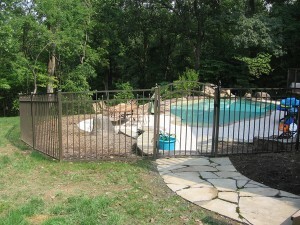 A popular option for pool fencing right now is aluminum, due to its durability, low cost, and range of available styles. Here are four reasons to install an aluminum fence around your pool. Aluminum offers a lot of versatility in your pool fencing. You can find aluminum fencing in a variety of colors and styles, allowing you to tailor your new fence to your home’s unique aesthetic. Consider powder finishes for a variety of color options, or customize your pool fence with an ornamental gate or special paneling design. Aluminum fencing is one of the more durable fencing options out there. Even lightweight aluminum fencing, which is a common choice for pool fences, is a durable option that will stand up to weathering and standard damage. You can go with an even stronger aluminum fence to secure your pool area or outdoor space if you have more serious security concerns. One of the greatest things about aluminum fencing is the low level of maintenance required. Since aluminum fencing is so durable, it won’t require constant maintenance, such as rust protection or warping prevention year after year. Powder paint coating makes aluminum a low- to no-maintenance fencing option–perfect for your pool area if you have children or frequent parties. Because of the powder coating, aluminum won’t rust, and they won’t fade as some other fencing materials will over time. Due to the low maintenance and variety of available options, it can be easy to keep your costs low when building an aluminum fence for your pool. By eliminating some of the most common maintenance costs, you can count on aluminum fencing around your pool as a sound investment. This even makes aluminum fencing a great option for just about any part of your property.